McCluskey Transport have been offering reliable, economical and personal services to its customers for over 25 years. The McCluskey family, have invested considerable resources and effort into their business and pride themselves in providing the best possible service possible within the removals industry. This is demonstrated by our fleet of modern, fully equipped, and well maintained vehicles, which are suitable for all types of professional transport work. Address: 71 Drumaknockan Road, Hillsborough BT26 6QP Tel. 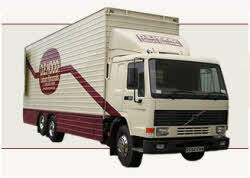 Welcome to Lisburn Removals. We are a family-run business providing domestic and commercial removal services within the UK and Ireland. Experience. We have more than 25 years of experience in all types of removal work from small local jobs to larger relocations throughout Ireland and to the UK mainland. Diverse range of vehicles. We have a modern fleet of vehicles which are suitable for all your transportation needs. Fully trained staff. Our experienced staff can assist you with every aspect of your move, from dismantling furniture and disconnecting of appliances to reassembly and reconnection at the point of arrival. You will find our uniformed staff helpful and enthusiastic in every aspect of your move.